Do any of you happen to enjoy Appalachian based folk and country music? If so, do I have a story for you! I recently came in contact with a man named Stacy Thomas after he posted a video of his grandmother, Annie Watson, singing an old folk song. Take a listen to this recording that was made in 1969 when Mrs.Annie was 74 years old. Nancy Adina "Annie" Greene Watson was born in Watauga County NC on March 22, 1895. Her parents were George Washington Greene and Mary Elizabeth Greene. She was the third of nine children. In describing her childhood she said her family was very poor. "We could not afford a coal oil lamp so our only light of a night was from a stick of rich pine (fatwood) stuck in a crack inside the fireplace." At age 16 she met and married 19 year old General Dixon Watson. General soon built them a cabin on the Osborne mountain near Stony Fork, NC on land granted to his Great Grandfather, Thomas Watson, for his service in the Revolutionary War. Their lives were hard but no more difficult than everyone else in their small, close nit community. 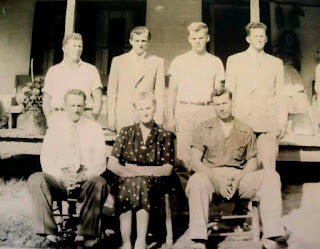 General worked at all sorts of jobs from sawmill to carpentry to cutting timber and of course farming his land while Annie kept up all the chores of keeping house and raising 9 children. They attended Mt Paran Baptist Church, some three miles from their home every Sunday. General was the "singing leader" for the congregation. General died of cancer in 1949. Annie never remarried and lived the rest of her life at the home place on the Osborne. She died in 1985 at the age of 89. 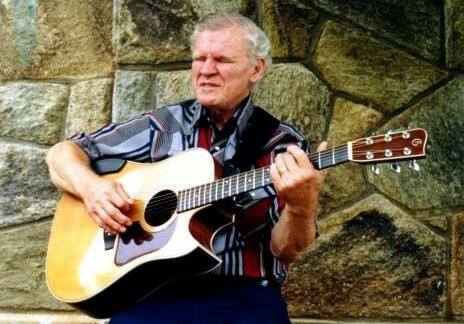 Her sixth child, Arthel Lane Watson, better known as Doc Watson went on to a career in music. Watson's influential guitar playing and his singing of traditional Appalachian music won him seven Grammy awards including a Lifetime Achievement Grammy in 2003. He was presented the National Medal of Arts Award in 1997 by President Clinton. Many of you will recognize the name, Doc Watson, especially if you're from NC. Every year, there is a festival called Merlefest in Wilkesboro, NC. It was hosted by Doc prior to his death and is named in memory and honor of his son, Eddy Merle Watson, who was killed in a farm tractor accident. Doc is pictured back row, second from right. I had read about the song that Mrs. Annie sang above in the first Foxfire book but had never heard anyone sing it. Now I can't get the tune out of my head! Do any of you remember hearing it? I've always been a fan of folk music, new and old. I know that the people who came to this country probably couldn't bring many possessions with them but thankfully, they were able to bring songs and their love of music. It is and I believe always will be a part of the Appalachian DNA.